Two things became apparent after the end of the Spring 2016 Smartphone Glut. One: Android is still a second-class citizen when it comes to gaming, and two: smartphones are in a ridiculously boring place. 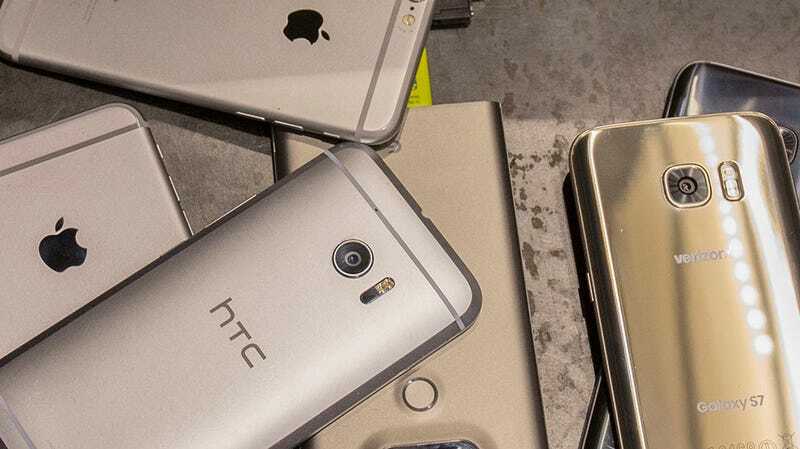 Sure, the iPhone SE was a pleasant attempt at diversifying Apple’s line up, the Galaxy S7 is water-resistant phone, the G5 has an accessory slot, and the HTC 10 is Android at it’s purest. But that’s genuinely all there is to each of them. These devices have not redefined the way we phone, nor have they blown us away with unprecedented speeds, or wowed us with extraordinary battery life. Each of these new phones is merely a marginal improvement over last year’s model. And they’re all actually remarkably similar in some ways. The Android phones all feature the exact same processor. They’re all using fast charge batteries that get you up to 50-percent battery life in a matter of minutes. They all have 1440p displays that are pretty damn stunning. They’re all slabs of glass and metal that will jut out of a woman’s pocket and stretch out a man’s. Consumers always win when consumer electronic improvements become glacially innovative. The only differences between them are in the minute details. This one’s water resistant, or that one has a “slot.” This one uses TouchWiz or that one uses near vanilla Android. The few phones that still excite people are the wacky ones (or the Apple ones). Phone design has plateaued. The wild advances we’ve seen for the last near decade are tapering off. They’re fast enough to play 1080p video without hiccups (something I wouldn’t dare to have said in 2014) and the cameras can catch decent images in low light. Even the screens have improved. You’ll be hard-pressed to find a truly ugly display outside of super budget phones intended for developing markets. Same with touch response. Four years ago, half the phones available were a nightmare to use. Forget playing games, it was hard enough typing your password. Now the real trial isn’t finding a good phone—it’s finding a bad one. And that isn’t a bad thing (as boring as it is for everyone covering it). Stability in design and marginal improvements in speed and battery life means you don’t have to upgrade your phone as often. Which is great now that most cellphone providers are moving to off-contract prices that can quickly reach $700 or more. Consumers always win when consumer electronic improvements become glacially innovative. But the companies lose. Apple saw their sales growth slow due to consumers’ boredom with the iPhone. Samsung too. The smartphone boom we’ve all been enjoying since 2007 is coming to a close. It’s happened before. In 1998 every computer looked the same—a beige box sucking dust in and spitting out heavily pixelated renditions of the Oregon Trail. Sales were slowing, the dot com boom bust was coming and everyone who was going to purchase a computer had. That’s when Steve Jobs returned to Apple and created the original iMac, and like the iPod and iPhone, it sent a shock through the industry. Design (and color) became critical to success. People got excited about computers again. I’m not saying we need a slew of neon orange and grape purple phones with translucent cases to reinvigorate smartphones. That would actually be awful. But after another year of boring upgrades and barely improved internal specs it’s clear the smartphone industry is shifting. Joining computers and televisions as once cool tech that’s gotten painfully boring (if absolutely vital to our way of life). It’s a bummer for our eyes and the companies’ bottom lines, but it’s going to be great for our wallets. So long two-year update cycle. I’ll probably hold onto my iPhone 6 another year.